An outcrop of granite gneiss over a billion years old rises above the wooded hillsides in Harriman State Park. Barren ourcrops such as these display abundant glacial striations from the geologically "very recent" ice ages of the Pleistocene Epoch. The Highland Region encompasses the upland areas of northern New Jersey, the Hudson Highlands region of southern New York (including Manhattan, the Bronx, and parts of Brooklyn and Staten Island), and upland parts of Connecticut. The region is a rugged, hilly to mountainous terrain, bearing the characteric scars of Pleistocene glaciation. The rocky outcrops visible on hillsides and along stream banks consist mostly of ancient gneiss and schist (highly metamorphosed sedimentary and igneous rocks) that were once buried many miles below the earth's surface. The figure below is a geologic map that generally encompasses the Highlands Region within the greater New York Bight area. Rocks of Precambrian, Cambrian, Ordovician, and Silurian ages are represented. Current understanding is that the age of the earth is about 4.6 billion years old, with the oldest known rocks on Earth's surface dated at about 3.8 billion years. The oldest rocks in the New York Bight region are found in surface outcrops throughout the Highlands region. These exposures of Precambrian "basement rock" have been estimated at 1.3 to 1.1 billion years old. These rocks underlie younger rocks throughout much of the area, and have undergone a high degree of alteration since their formation. The early stages of alteration occurred in a mountain-building episode that affected the entire eastern margin of North America. This mountain-building episode is collectively known as the Grenville Orogeny which ended roughly a billion years ago. During this period older rocks and sediments were subjected to deep burial and metamorphic alteration. 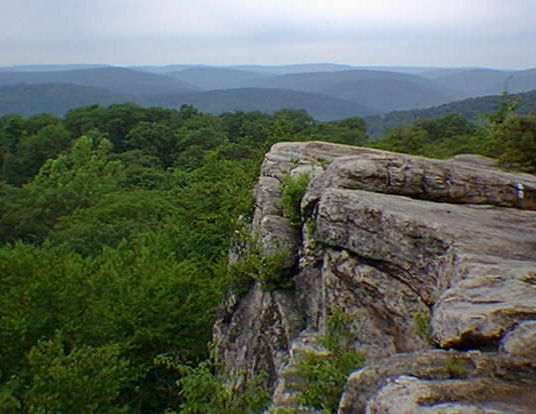 A long period of uplift and erosion followed the Grenville Orogeny; yet later periods of mountain-building related to the formation of the Appalachian Mountains also contributed to the alteration and tectonic deformation of these rocks. Beginning roughly 700 million years ago rifting began along the eastern edge of the North American continent. The rifting led to the formation of the ancient Iapetus Ocean, a waterway that has since vanished by later collisions between continents (via processes associated with plate tectonics). Two "smaller" mountain-building episodes occurred in early Paleozoic time: The Taconic Orogeny and the Acadian Orogeny. The Taconic Orogeny began in Cambrian time (about 480 million years ago) and ended around Late Ordovician time (about 440 million years ago). During the Taconic Orogeny a small landmass, similar in size to modern Japan, was accreted onto the North American continent in the southern New England. Before and during this orogeny, sedimentary deposits formed on the margins of both the North American continent, and within an intervening deep marine basin. Today, these sedimentary rocks form the core of the Taconic Mountains (east of the Hudson River, generally north of the Tappan Zee Bridge). As with most mountain-building episodes vulcanism occurred concurrently with tectonism. Igneous intrusions occurred throughout the New England region. Heat and pressure associated with deep burial and tectonic deformation converted sedimentary and igneous rocks to metamorphic rocks (marble, quartzite, phyllite, schist, and gneiss). A second event, the Acadian Orogeny, began in early Devonian time (about 410 million years ago) and ended at the beginning of Mississippian time (about 350 million years ago). This orogeny is also associated with the collision and accretion of a smaller landmass (the Avalon Terrane) in the northern New England region, however, tectonic deformation associated with this event (particularly faulting and folding) affected much of the entire New York Bight region. A final mountain building episode, called tha Appalachian Orogeny, began about 310 million years ago, and was the result of continental collision between North America and Africa. This resulted in partial formation of the supercontinent Pangaea. The Appalachian Orogeny (or Alleghany Orogeny) is responsible for the formation of the folded and faulted mountain belt that extends from southern New York southward into Alabama and beyond. The orogeny ended during the Permian Period (about 250 million years ago). The Appalachian mountain building event created a vast mountain range and further deformed and metamorphosed rocks previously altered by earlier mountain building episodes. 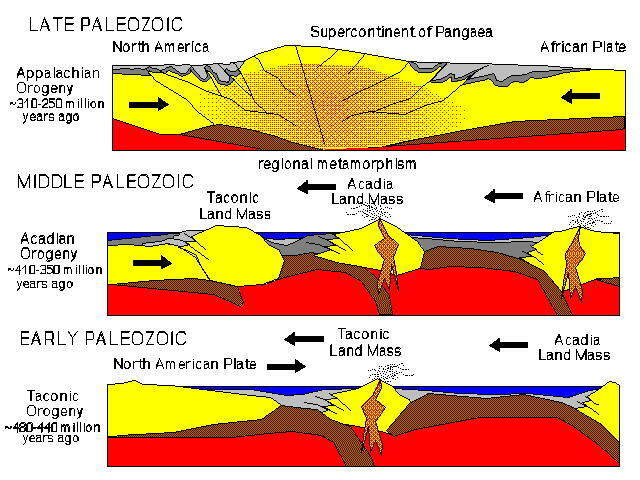 The figure below is a generalized graphic summary of how the the three episodes occurred in relation to plate tectonic theory. After Pangaea formed an extensive period of erosion followed as the suppercontinent continued to evolve. Beginning in Triassic time Pangaea began to be pulled apart, beginning a phase of rifting, sedimentation, and volcanism. A short summary as presented above does not do justice to a half a billion years of earth history! Additional information follows on the Catskills and following geology web pages. The Highlands Region can be a host to a wide variety of geology field trip destinations. Of particular note include the famous iron and zinc mines and museums of the Franklin and Ogdensburg, NJ area. Another popular hiking area in the Highlands region of New Jersey that displays abundant geologic features is the Pyramid Mountain area near Boonton, NJ. Fantastic hikes in the Highlands region of New York include the very popular Harriman State Park (the image shown above) and Bear Mountain State Park.